More fun on the roof this afternoon. It rained against yesterday -- another 1 1/2 inches in my rain gauge pot, even with the dog taking a drink out of it (she thinks I keep it there for her convenience). Plus, downtown San Francisco flooded, with the subway full of water and ground floor shops having to close and everything. Very dramatic, though of course it was less dramatic here, because the one big roof repair Noel did over the weekend helpd up perfectly, and for the first time ever, the attic was nice and dry after a heavy rainfall. Today he made another foray, to deal with the last little seam of the part of the roof that's over living space. This is a little section of hip roof returning towards the front of the house. At the top where Noel is scraping away at the old tar is that crazy big hole. While Noel scraped away at the tar, I checked out some other things on the roof. 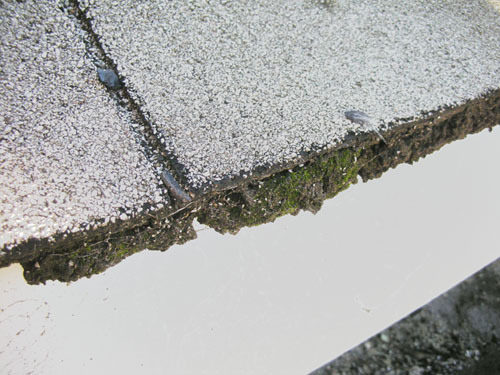 Like how all the old wooden shingles peeking out from under the asphalt shingles have moss growing on them. 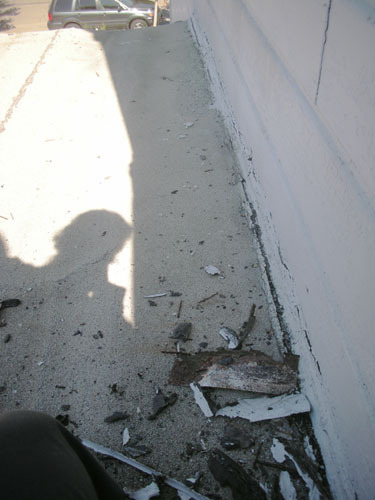 And this is the part Noel didn't do today: the crack along the sides of the side porch roof. It's not actually leaking all that much, and it just leaks down onto the side porch. So far, not a huge issue. I say that so that when we uncover it in a couple years I can kick myself for being so blithe. But the best discovery, the one that made my day, was that not only are the shingles on the bay on sideways, but somebody at some point came up there and tried caulking it (you can see the little stripes of caulk between the flaps of the shingles). Because, you know, that was effective. I'm halfway surprised nobody tried putting a layer of concrete or fake wood paneling over it, but we haven't seen what's under the shingles yet. Yeah. So one of the things Noel cleaned out there was this enormous hole (not the one at the top, this is another one). This is where the majority of the water from this part of the roof was getting in, and this, combined with its twin on the other side of a quoin coming down from the second-story roof, was the cause of all the water damage in the downstairs hall and on the north side of the dining room (one of the walls we're planning to de-plaster this weekend). And that's only the half that isn't behind the bathroom wall. Duuuuuude. Fortunately, it turned out to be an easy hole to patch up, with some foam back rod stuffed in the gap and a decent layer of goo over the top, it was as good as gone. At the big hole at the top of the roof, Noel fitted in some flashing to cover the big gap, then the same routine. He looks awfully comfortable up there. I was starting to get queasy just looking at the photos. for gods sake, why dont you just put on a new roof. what you have is absolutely junk. And I don't think either of us has ever claimed our roof was awesome. We're just trying to make it work with what we have. I was thinking of your roof repairs when the big storm swept through around 3:00pm Monday. Glad it worked out well. Neal, I was also thinking of our repairs. And the things we hadn't repaired yet! I thoroughly enjoy your blog and cannot understand why some people have to make disparaging remarks... 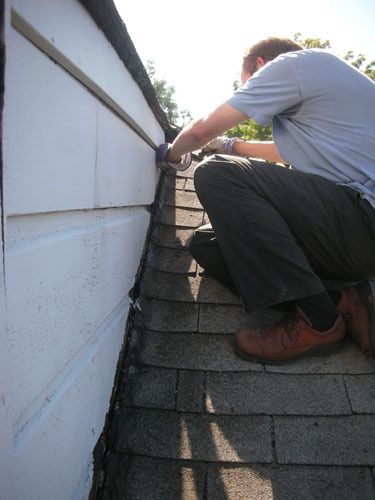 If "noearch" is so bothered by your roof repairs, why read your blog? 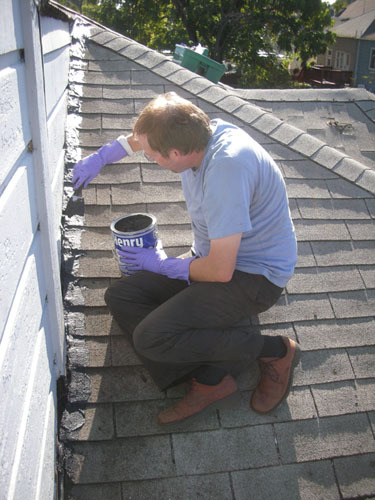 Roof repairs are one of those things that can help a homeowner limp along for another year or two until he/she can afford to replace it in its entirety. Noearch is a regular detractor. I can only assume it's somebody I know professionally, because I can't think of any reason for somebody to always show up wanting to tell me UR DOIN IT RONG for no good reason. 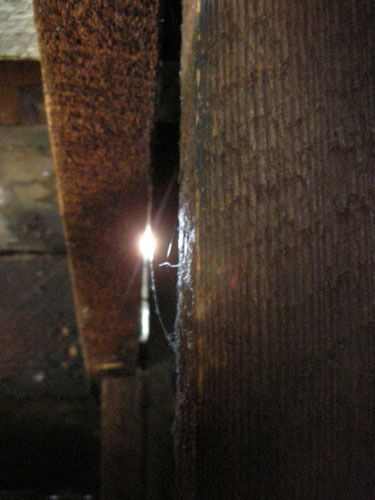 Also, our roof is a few decades past the "limp along for a year or two" point. But that somehow has not magically made it possible for us to throw money at the problem. $25,000 for a new roof? Yowzaa...is that an actual estimate? That's for ripping the roof completely off, rafters and all and rebuilding it? Daaaang we're going to have to do that someday also and I was hoping it wouldnt have to cost that much...sure you need to replace the framing? 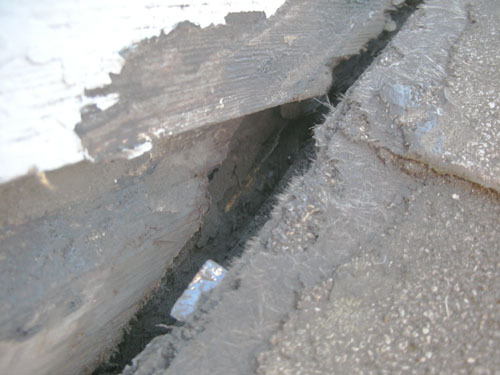 Most of the framing is pretty rotted, so it needs at least partial replacement. And yes, $25,000 was the actual estimate (OK, it was on the high end, but that was from 2004 when prices were actually lower). 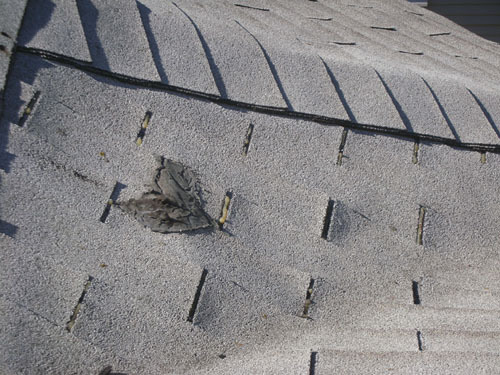 Our neighbors have used a different roofing company that gave a much lower estimate for our roof ($7800) but we're not convinced there's not something really crappy up there that would change the number substantially. And we already have the house mortgaged at over current value (not sure how much, but I know with the dip in property values this year we went under water). We paid for two foundations, after all. sorry if you feel I'm a detractor. not my intention. and No we don't know each other, although I am an architect in SF. 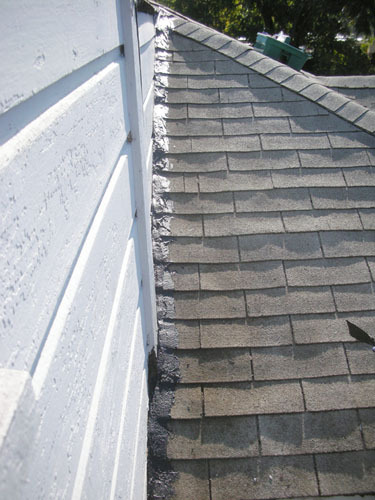 Perhaps my point didnt come thru..Here's what I was trying to get across..A roof is of UTMOST importance on any project. 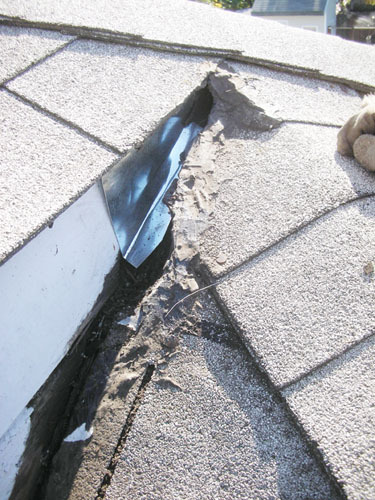 While budgets are important, if your patched up roof leaks in various places it can and will destroy any hard work you have put into the interiors. I recently completed a major renovation to my 1904 Victorian; from foundation to roof including a major rear 3 story addition.As soon as the foundations were completed a new roof was installed on the existing house and the new addition, before any more interior finish work took place..There was too much at stake to risk damage to 3 new baths, new bamboo floors, new kitchen, plaster, trim, etc. No intent on my part to disparage any of your work (although it does seem to go on for a long time). I wish you luck and hope your existing roof holds up til you install the new one. Noearch, you show up here to tell us we're doing it wrong all the time. That's the role of detractor. I love when architects talk about budget. You act as if the client can just come up with money out of somewhere like magic, just because you want it to be that way. Budgets are important, yes. But you don't seem to understand what I mean when I say that we don't have money. What I mean is that there is simply no money for a new roof. $0 in the savings account. We have no equity. We cashed out all my investments. We sold most of our personal possessions of any value. We borrowed against retirement accounts. It's not that we're obstinately refusing to expand the budget. "While budgets are important" doesn't come close to understanding what the situation is. To be totally clear: we have no money. We're not going slow because we're trying to stick to some mythical budget; we're going slow because we can only work as fast as we can afford to pay for stuff. In addition to us fully mortgaging our own house and cashing out retirement finds to get the work fixed and done, my parents took out a mortgage on their home to help us out. It is of far greater importance to me to repay them and make them whole than it is to get my work done on a schedule that suits one of our readers. Especially since our schedule suits us just fine. We bought this house as a hobby house, not just some space we want to fix up and ignore. We like working on the house, and we're happy to do so for as long as it takes. Also, you might have noticed we didn't put in all kinds of new finishes under a leaky roof. (We had to put some new finishes inside to make things good for the building inspector.) There's a reason why not every room in the house is finished off. We're often naive, but we're not outright stupid. Thank you for your refreshing clarity and openness about your financial situation. I think your willingness to share it is admirable - especially as your comments are moderated, so you don't have to post detractors' remarks - as is your determination to pay back your parents. Dare I ask whether there's been any movement since your hints about certain restrictions on talking about what got you into this financial mess lifting in the near future? To be charitable, I will to presume that Noerch keeps coming back because there just aren't that many blogs of really interesting historic project houses that give the kind of extensive and well-thought-out detail that your blog does. Of course, the people doing really interesting historic project houses with money to spend on them mostly aren't blogging, they're waiting for national magazines to come do professional before-and-after articles on them, so that means the few good blogs are done by quixotic people who are willing to spend time and effort on free content for the masses. Thanks once again for that, by the way. Thank you, Jessamyn. I appreciate our regular readers and especially those who add comments, either pro or con. Moderation here is mostly for spam control (I'm having trouble keeping the amount down), rather than to keep people who disagree with me from commenting. In the time we've had comments open, I've disapproved three comments, all because they were more about making personal attacks on me (men seem to really really dislike the idea that a woman might know a lot about construction, for some reason) than about the blog or the house, but for the most part those people seem to keep it to e-mail. I honestly don't usually worry too much about whether other people think we're doing stuff wrong, or too slowly. But it's a bit disingenuous for a regular reader to show up and act as if the only reason we didn't pay for a new roof is that we have our priorities wrong. As for that other situation, I can't talk about it, for all it seems to have sucked up all my spare time for the last six months.